Today I'm sharing the Christmas card that I am making for my mom and dad to send out this year. This will also be their first look at it. I'll be making about 40 of these, then moving on to other holiday projects. Hope they like it! 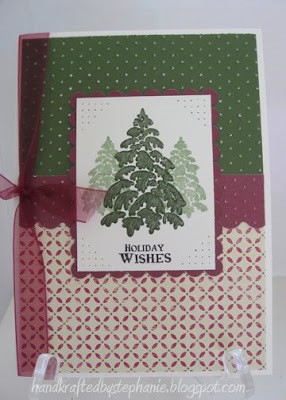 Cardstock (CTMH), Patterned Paper (Making Memories Fa La La), Cuttlebug Swiss Dots Embossing Folder, Nestabilities Scalloped Rectangle, Stamps (CTMH, Verve), Other (paper piercing tool, ribbon, clear glitter pen).